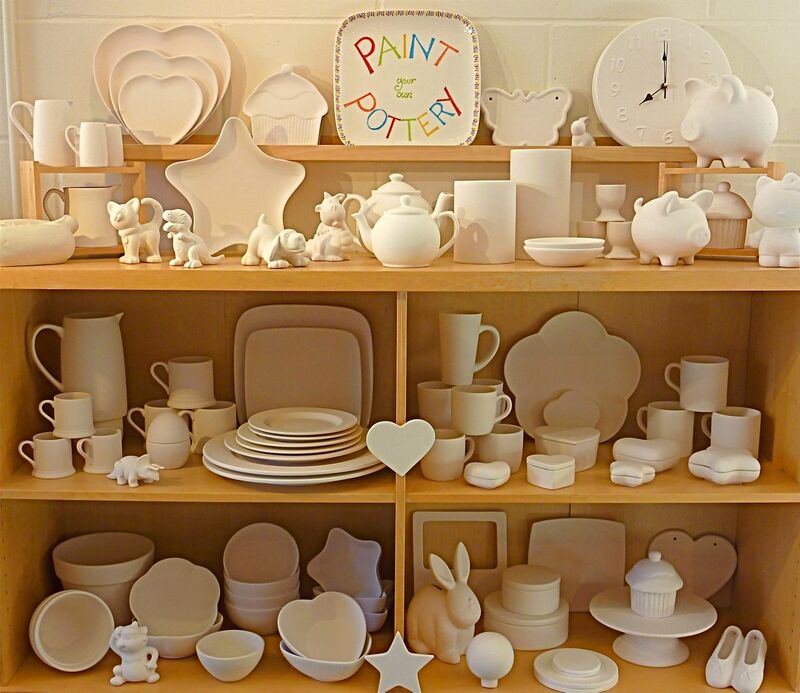 Creating your own original ceramic is easy and fun – and you don’t have to be creative to do so! Suitable for all ages and any number of people; adults, children, individuals and party groups. We provide the perfect opportunity and everything you need to create something unique for you to keep or create an amazing present for someone, in a relaxed and welcoming environment. Open 7 days a week, 10am – 5pm. Choose from over 250 items of attractive and functional bisqueware, including plates, mugs, bowls, jugs, moneyboxes, clocks, vases and so much more. Sketch or trace your design then paint your piece, choosing from a range of over 30 contemporary colours. We provide everything you need, paints, brushes, sponges and stencils and our friendly and experienced staff are full of great ideas and on hand to help if you require. You can find inspiration from our reference books, or the gallery artwork. The studio fee is £4.50 per painter plus the cost of the item(s) you wish to paint. Leave your finished item with us to glaze and fire, ready for collection within a week. 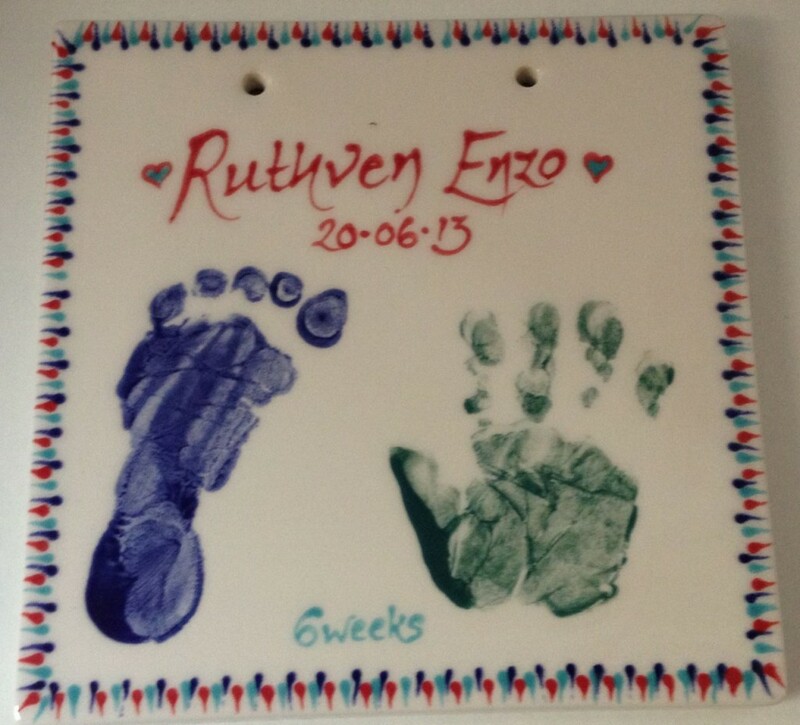 This is a wonderful way to record the birth of your baby, and a unique gift for Grandparents, Uncles, Aunties and God-parents. Our friendly and helpful team is on-hand to assist in creating your magical memento. 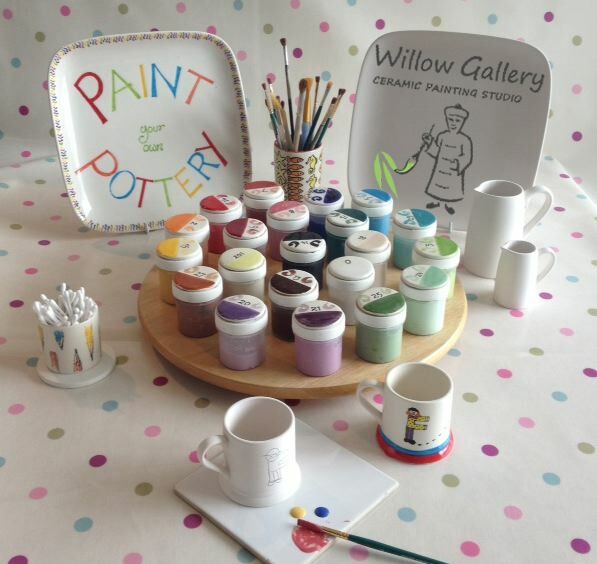 For a unique gift at weddings, anniversaries, births, christenings, retirement and leaving parties, personalise an item with names, dates, signatures or your own design. .
For parties of 6 or more, aged 5-15, we offer a party price including Invitations, the studio fee and a choice of item to paint including mugs, bowls, plates or item of the month. We also provide a free breakfast plate for all the party guests to decorate and sign as a memento for the birthday child; all for just £14.50 per child. We can also provide a lovely party buffet from £7.50 per child and the use of our party room, subject to availability. It is not possible to bring your own food or drink but you are very welcome to bring a birthday cake to have afterwards, or we can arrange for you. Remember, it’s not just for children’s birthday parties! Also ideal for grownup birthday parties, Hen Parties, Family Occasions, Team-Building Events, Mums & Babies groups, Brownies and Cub Scouts, WI, and many more. It’s great fun, you’ll love it! Have a soft drink, tea or coffee and perhaps a slice of delicious homemade cake, enjoy a luxury ice cream, or just browse through the design books for inspiration and let your creative instincts flow! 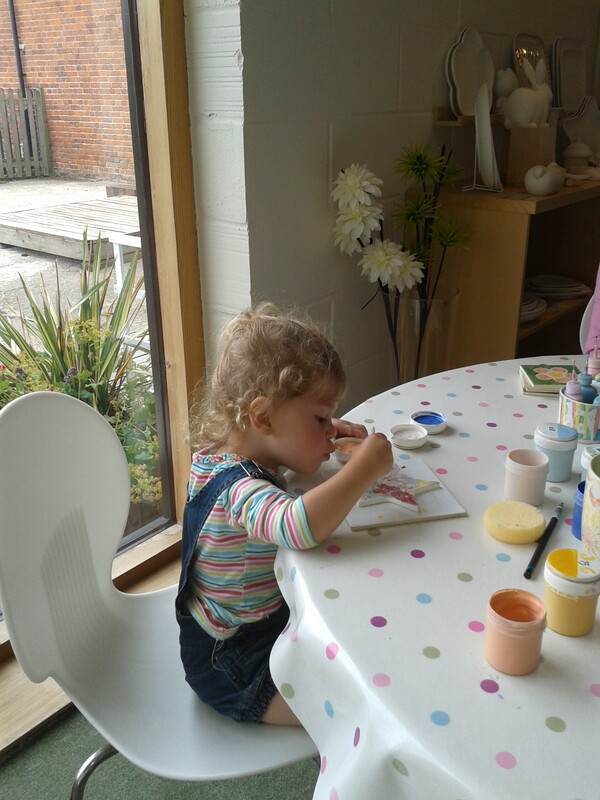 Painting ceramics appeals to both adults and children alike. Come along on your own or with a group of friends to paint something special and why not follow this with a delicious light lunch in the extended tearoom? 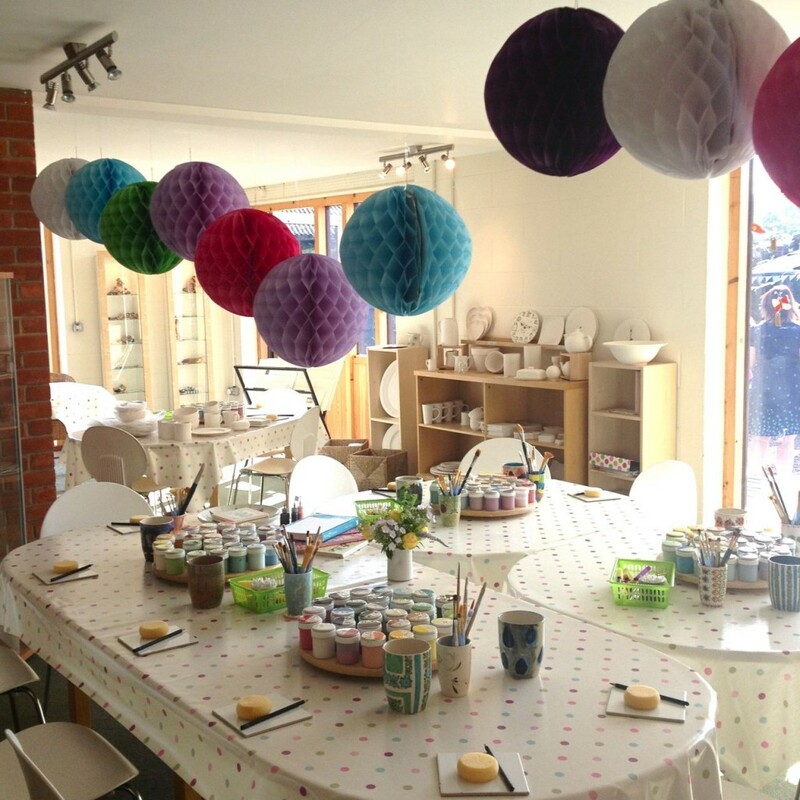 GIFT VOUCHERS for the Ceramic Painting Studio make ideal presents. Available from £10 upwards. 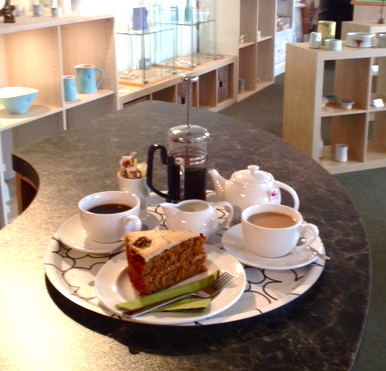 Open 7 days a week, 10am to 5pm…..Creative fun for all ages! It is not always necessary to book though advisable at weekends and during school holidays and does of course ensure you have a table reserved in your name. We are unable to predict how many other customers without bookings will arrive on the day but will hold your table if you have booked in advance. Neither this website, the email address or the Facebook page are automated and not therefore manned outside of business hours; if you leave a message regarding a booking and don’t hear back fairly quickly, please call 01508 493627 between 10am and 5pm where we will be able to confirm your booking in person. You are very welcome to leave a telephone message; we will return your call as soon as possible.